Behnaz Atighi Moghaddam is an assistant curator in the Middle Eastern section at the V&A. Since she joined the Museum two years ago, she has carried out research on talismanic shirts and other objects of that type. Thanks to this expertise she was temporarily drafted onto the Fabric of India team when conservation work began on the V&A’s own talismanic shirt, which will appear in the exhibition. Behnaz provided invaluable insight into the object, and she generously agreed to give us all a primer on talismanic shirts for today’s blog. The Fabric of India exhibition will display a vast range of exquisite examples of textiles from all over India, dating from the 3rd to the 21st century. However, amongst all of those treasures on display, the object I am most intrigued by is an Islamic talismanic shirt. As an assistant curator in the Middle Eastern section, I wasn’t at all expecting to be involved with The Fabric of India exhibition. But as my research interests include epigraphy, textiles and talismanic objects, I was invited to the Textile Conservation department to discuss the V&A’s spectacular example of a talismanic shirt with the Fabric of India team. The shirt they wanted me to discuss for the exhibition will be going on display for the first time since it was acquired by the Museum in 1935. What a fabulous opportunity for me to combine my love of textiles and talismans, and to perhaps be touched by some magic too! A talisman is an object that has protective powers. In Islam, most talismanic objects are designed and decorated with astrological signs, magic squares, abjad numerals, religious narratives, representations of the prophets in a variety of media, and Qur’anic inscriptions. 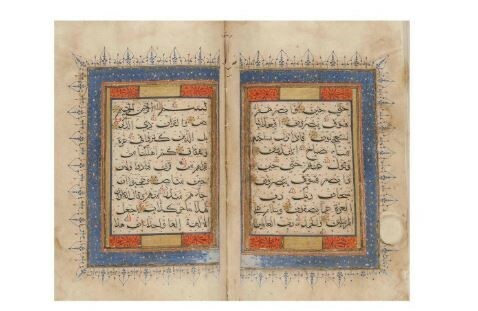 The Arabic text of the Qur’an is sacred to Muslims and because of this, many believe that an object which is inscribed with the words of God will protect the person who reads, touches, carries or sees it from misfortune and evil. Talismanic objects were made in many different forms and sizes, and some were even worn as clothing, as in the case of the shirt discussed here. The talismanic shirt to be displayed in the show has been attributed to India and dated to some time in the 15th or 16th century. It was produced during the period of the Delhi Sultanate (1206–1526), a Muslim state that ruled over vast areas of the Indian subcontinent. Early examples of these shirts from India, such as the one chosen for The Fabric of India exhibition, are exceptionally rare – especially so, one in such wonderful condition. At first viewing, this shirt appears to be made from paper, but like the majority of surviving talismanic shirts, the V&A’s shirt is actually made from cotton. It is constructed from three pieces of cloth that were stiffened and polished: one large rectangular length with a circular opening for the neck and a slit at the front so that it could pass over the wearer’s head, and two smaller pieces forming the arms. The Textile and Science Conservation teams at the V&A carried out analysis on the cloth to find out what was used to stiffen it. Their results showed traces of starch, which was commonly used in the Islamic world in the size used for the surface treatment of paper and textiles. Size was applied as a paste, and once dry, it was polished, forming a reflective, smooth surface. Using size was crucial as it provided scribes and illuminators with a smooth surface to work on, allowing them to accomplish the high precision and quality seen in this example. Of course, it also stiffened the cotton, like the starch we still use today. It may seem impossible, and is certainly incredible, but the entire text of the Qur’an adorns the surface of this shirt. Most of the text is densely packed into square compartments separated by gold rules, with gold medallions at every intersection, and bordered in bright red and blue. On the outside, the areas containing the text are framed by blue, gold and red rules, all outlined in black. The remaining text is included in a fringe of pointed lappets around the bottom fo the main design. 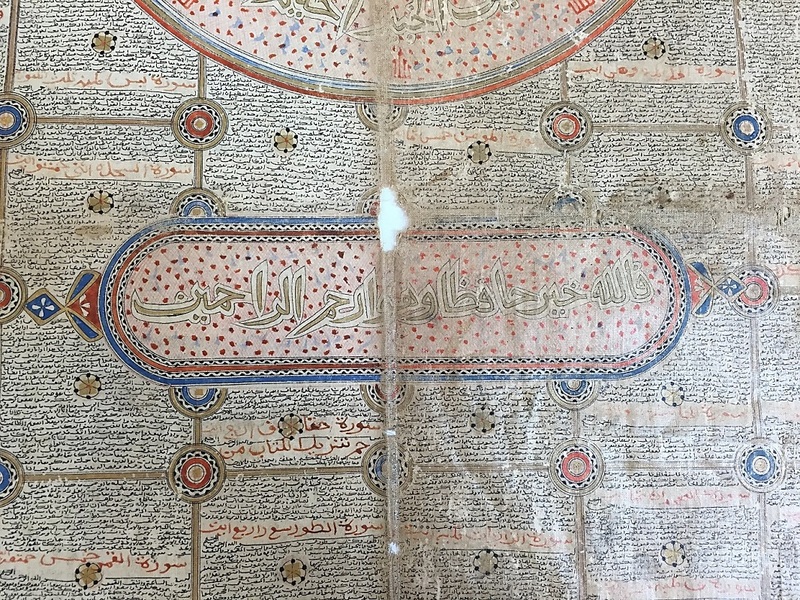 Between the two sections of text, the asma-al-husna, the ninety-nine names of God, are executed in gold Bihari script on a wide border with a ground cross-hatched and speckled in red. Bihari is an Indian style of writing the Arabic script. 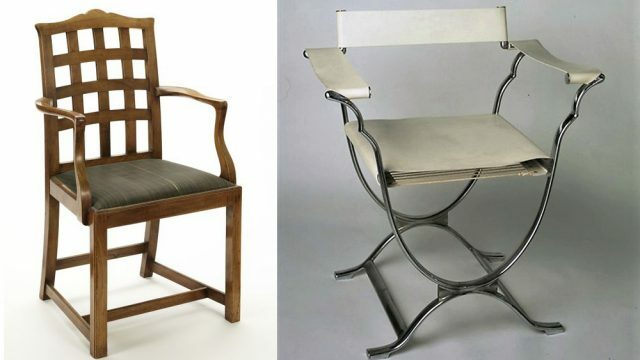 The style’s origins are obscure, but it is closely associated with the Sultanate period, and it began to fade out with the arrival of the Mughals in India at the beginning of the 16th century. The shirt can be dated from the style of the script and illumination, which although on a textile object, speak more expressively as representatives of the art of the book. 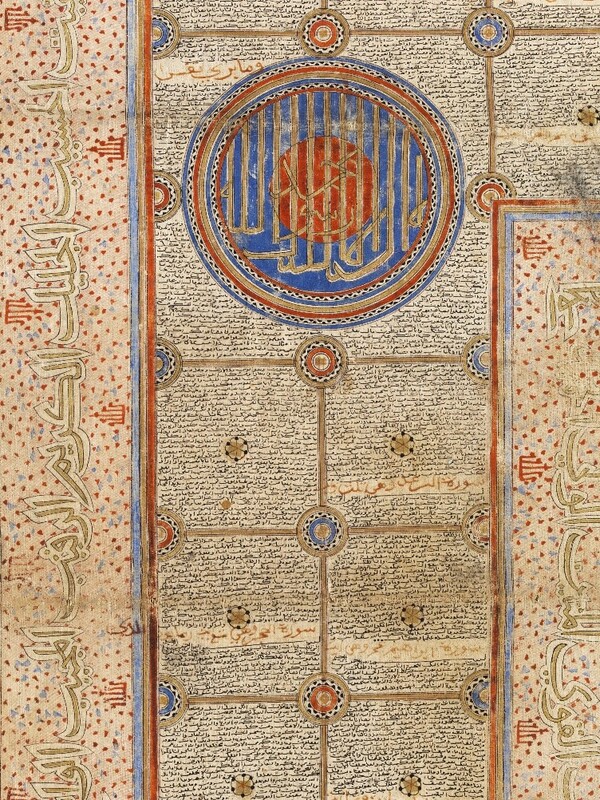 The Bihari script written in gold, the illumination in blue, red and black, the cartouches and roundels containing chequerboard patterns, and the small red and blue motif resembling the word ‘Allah’ in Arabic script closely relate to surviving manuscripts attributed to the Sultanate period. 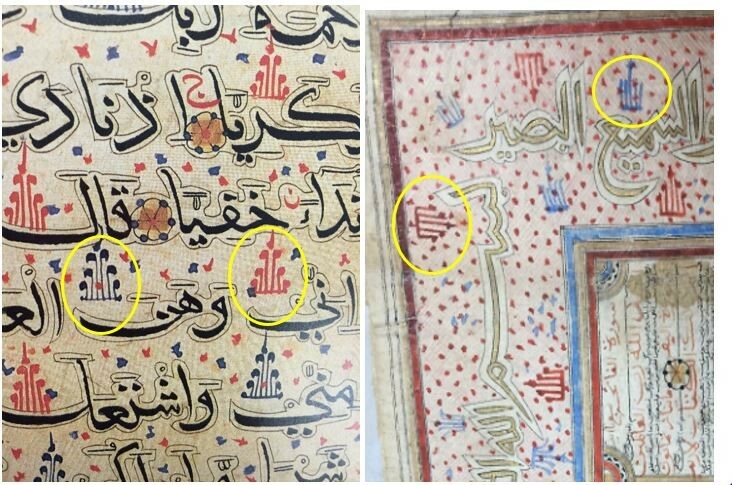 The images below are examples from Indian 15th and 16th century Qur’ans. Talismanic shirts such as these were of immense religious and monetary value amongst Muslim rulers and elites in Africa and Asia. Four distinctive types of Islamic talismanic shirts have been identified: Ottoman, Safavid, Mughal (Indian) and West African –none of which can be dated to earlier than the 15th century. Each group has its own unique stylistic approach to the shape of the garments and the talismanic formulas used, as well as the design of the illumination. A very small number of these garments are signed and dated, one of which belongs to the Ottoman group and is housed in the Topkapı Palace Museum in Istanbul. The Topkapı shirt was commissioned for Cem Sultan (d.1495), son of Sultan Mehmed II, and includes not only the exact date and time at which the construction of the shirt was begun, (30 March 1477, Tuesday, 12:36pm, the Sun in 19 degrees Aries), but also the exact date and time it was finished (29 March 1480, Sunday 3:57am, the Sun in 19 degrees Aries). Topkapı’s dated example gives an unusually accurate idea of how time consuming the production of such garments could be – three years to complete a single shirt. By comparison to how accurate curators can sometimes be about the making of these incredible shirts, their function is far more debatable. Unfortunately, there are very few sources that discuss or even mention the use of these objects. 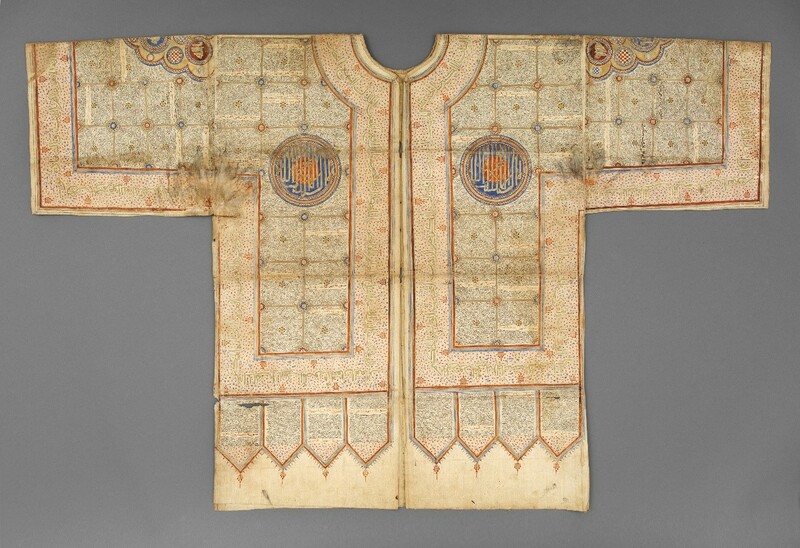 One source, written in the 1530’s in Istanbul, describes a shirt made by a holy man in Mecca through which neither bullets nor swords could penetrate. That shirt was commissioned for the Ottoman Sultan Suleiman the Magnificent (1520—1527) by his wife Hürrem Sultan, and still survives to this day. It is also housed in the Topkapı Palace Museum in Istanbul. Though talismanic shirts were used as protection from disease, famine, difficult child birth, sudden death, and the unpredictability of travel, it is believed that the majority of these shirts were meant for use in battle. Particular verses from the Qur’an that refer to victory were commonly inscribed on shirts worn under armour – the word of God was intended to protect the owner while they fought. The V&A’s example belongs to this group of shirts: the presence of the verse from Surah Yusuf, referring to protection and mercy, indicates the shirt’s purpose. Fascinatingly, there is even evidence that this shirt really did fulfil this purpose: if you take a close look you can see signs of soiling from wear – the sweat of the wearer having caused the loss of the decoration under the arms. Having studied this wonderful, rare object I feel strangely drawn to whomever it belonged to. I want to know the owner of this incredible shirt and to know something about the many battles and other occasions he would have worn it at. I wonder how brave he felt wearing the shirt and whether this made him a fiercer warrior, or perhaps it really did save him from bullets and swords. Did he die a warrior or as an old man, forever protected by his magnificent garb? Since analysing, studying and wondering about this shirt and its owner, I am constantly on a quest for an illustration that would include even the slightest hint of one of these shirts being worn. If you happen to know of one, please get in touch! I hope that you, too, will be touched by the magic of this remarkable talismanic shirt once you see it on display. I will be working on a display on ‘Magic’ in the Islamic Middle East Gallery of the V&A sometime in October. It will hopefully also include an Islamic talismanic shirt, amongst the other magical objects from our collection. 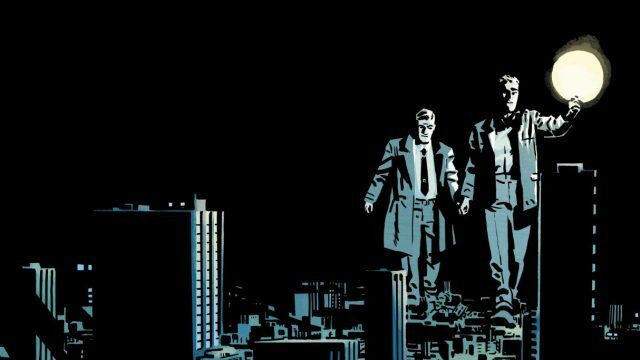 What a fantastic article! The author is obviously incredibly knowledgeable about such a rare item and she has managed to combine beautifully both her academic knowledge and fascination with the ‘magic’ of this talismanic artefact. Thank you. You have really made me want to see this incredible shirt myself and perhaps be touched by some of it’s magic as well! Thank you for such a fascinating post! We are really looking forward to seeing this exhibition. Thank you for all this information on this ‘wonderful and rare’ object. I live in Australia so I am far, far away from the V & A, but am looking forward to purchasing the catalogue of the exhibition as I will miss it by a week when I am in London next. A very informative and beautifully written piece! So interesting and has really enticed me to want to know more and visit the exhibition!! I look forward to seeing it! What a fabulous and informative article. I am a textile designer and natural dyer who lives in India, in Bhuj, Kutch, and am constantly inspired by the way the sacred filters into every part of people’s lives here. The process and journey from devotional item to sacred textile reminds me of the mata ni pachadi cloths that are produced in Ahmedabad. I am looking forward to seeing this shirt when I come back to London to see the exhibition. So good to read this interesting and informative account of a very special garment. What a fascinating study! I look forward to seeing the exhibition, the shirt, or one like it, and other talismanic objects…….. the idea of which has always seemed significant to me. I am a craftsperson, mainly working in clay and to me the hands of the maker/designer seem very present in this magical item. Thanks for posting such an enticing article. Thank you for the information. 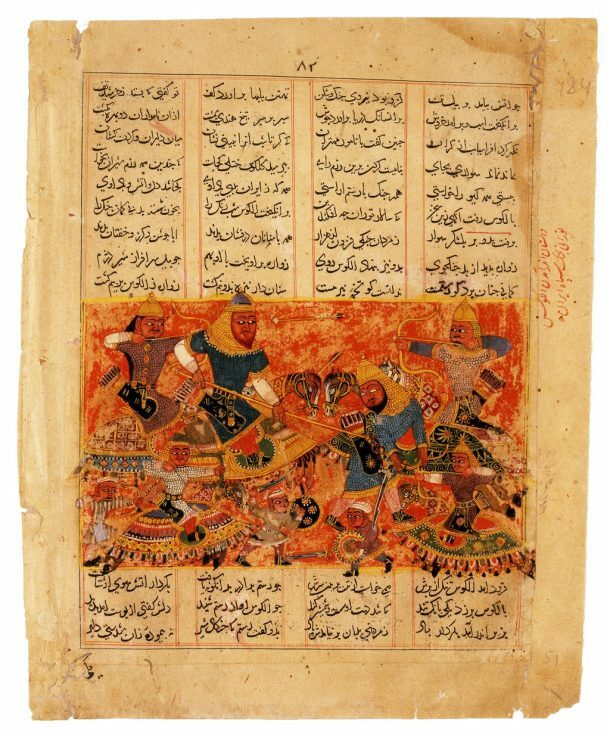 However, as a museum curator I was shocked to see that my museum’s sultanate miniature, “Rustam Kills the Turanian Hero Alkus with his Lance”, inv. no. 3/1988, was used as an illustration – not only without indicating that it belongs to my museum, but with copyright belonging to “Boundless Art History”. 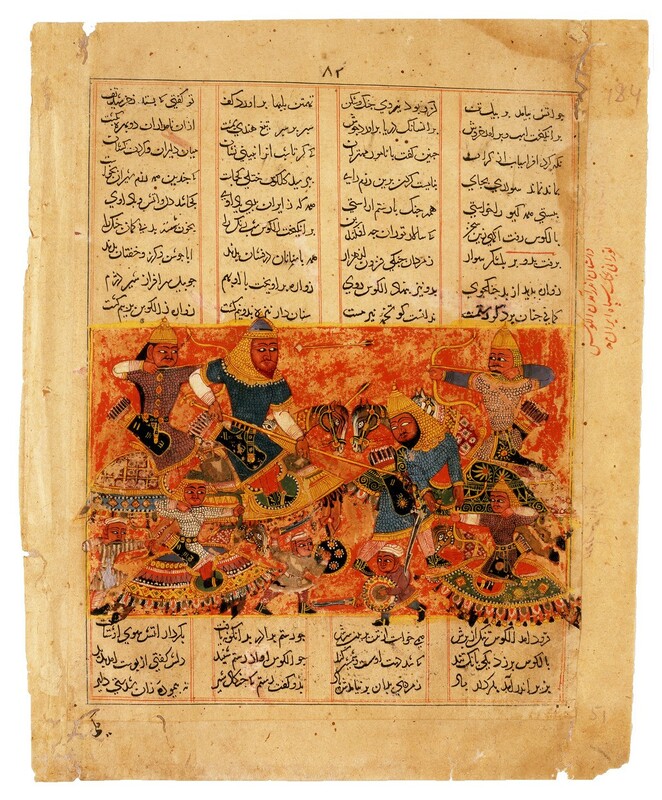 “Rustam Kills the Turanian Hero Alkus with his Lance”, inv. no. 3/1988 belongs to The David Collection, Copenhagen. Thank you so much for bringing this to our attention, and our sincere apologies for mis-crediting the image. It seems we confused its source, but I have now updated it with the correct information. Many thanks again for letting us know!